Alstonia macrophylla var. acuminata (Miq.) Monach. Alstonia macrophylla var. mollis Merr. Tree with little white sap. Leaves in whorls of usually 4 leaves, lower surface greenish, secondary veins placed farther apart than most species in the genus. Fruits very long and narrow, placed in pairs; splitting open to expose many small seeds with two tufts of hairs for wind dispersal. Grows in a wide range of vegetation types and soils in primary and disturbed forest ranging from flooded areas to montane forest, on soils ranging from sandy clay to limestone, from sea-level to about 2900 m altitude. Quite often found near the coast, just behind mangrove forests, but also in mixed dipterocarp forests. Usually on ridges and hillsides with sandy to clayey soils. Also growing on ultrabasic and limestone soils. In the Philippines, the bark in the form of powder, decoction, infusion, tincture or wine preparation is used as a febrifuge, tonic, antiperiodic, antidysenteric, emmenagogue, anticholeric and a vulnerary. In Thailand, the bark is used as a tonic, antiamoebic, emmenagogue and antimalarial. 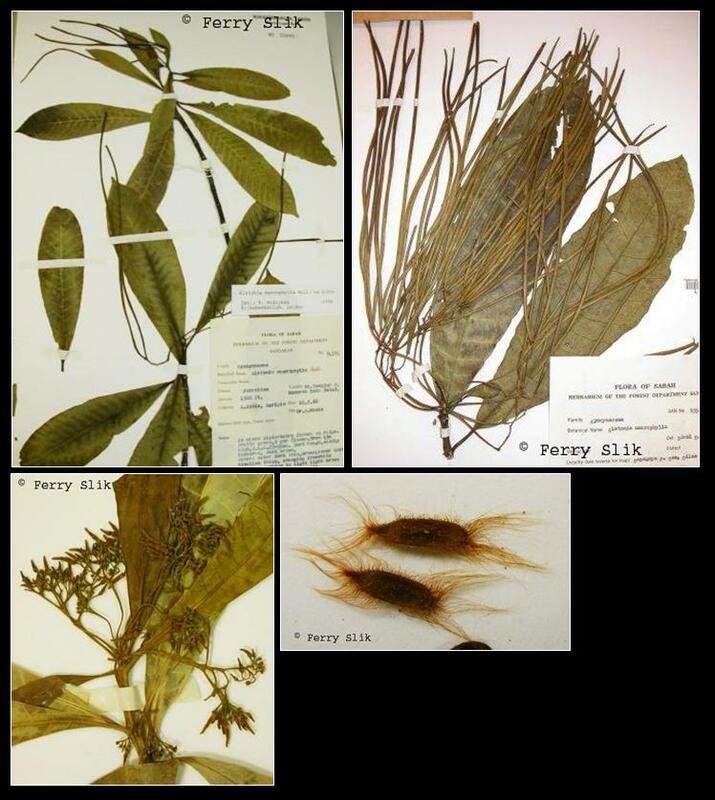 In the Central Province (Papua New Guinea) a decoction of the young leaves is drunk to cure lung and ear congestions. In the Oro (Northern) Province (Papua New Guinea) the scraped bark is mixed with water and drunk, as well as used to wash the forehead, to relieve a headache. The wood is used as hard alstonia. Powdered bark mixed with water is used against skin diseases. India and Sri Lanka, into Indochina, Nicobar Islands, Thailand, Peninsular Malaysia, Borneo, the Philippines, Moluccas, and New Guinea. Cultivated in Africa. Borneo: Bakau; Bundu-bundu; Mangalang; Pulai daun besar; Sarakad; Sayongan; Tunjang pipit. English: Hard alstonia, hard milkwood (En). Indonesia: pule batu (Ambon), kai riti (Seram), ai oi (Biak). Malaysia: pulai penipu bukit (Peninsular), pulai daun besar, sayongan (Sabah). Papua New Guinea: ai wawoi (Papua), andelagar (Enga), dero (Madang). Philippines: batino (Tagalog, Bikol, Pangasinan), kuyau-kuyau (Bikol), itang-itang (Panay Bisaya). Thailand: thungfa, kra thungfa hai, teen thian (peninsular). Vietnam: s[uwx]a l[as] l[ows]n, m[ows]p l[as] to.